Lyric Street Records performed their first ever Fan Fair show (Wednesday, 14 June, 10-11:30am) this year. Needless to say, they saved the best for last....Aaron Tippin. Aaron, who appeared with his band, the Stemwinders, sang six songs: What This Country Needs, There Ain't Nothin' Wrong With The Radio, For You I Will, My Blue Angel, You've Got To Stand For Something and his newest single, Kiss This. As always, Aaron's performance was dynamite..... His shows never fail to bring the audience to their feet; this show was no exception. Kiss This, Aaron's encore song, is from his new CD, People Like Us (release date: 25 July). Aaron informed us that he co-wrote the Kiss This with his wife, Thea, and Philip Douglas. Then, he brought Thea out on stage to sing harmony on the song. By the way, the video for Kiss This was also released on CMT's Delivery Room on Wednesday. As in past years, Aaron signed autographs at several Fan Fair booths: CMT booth on Monday, 12 June, 11-12noon; GAC booth on Monday, 12 June, 3:30-5pm; and Country Weekly booth on Wednesday, 14 June, 4-5pm. Because Aaron's Fan Club will soon be ending, Aaron did not have a Fan Club Party this year, nor did he have his own booth. 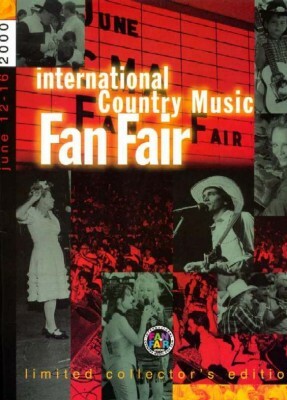 However, Aaron was not absent from Fan Fair this year, as were many of the country music artists. Aaron has always taken time for his fans; I'm sure this will always be the case.